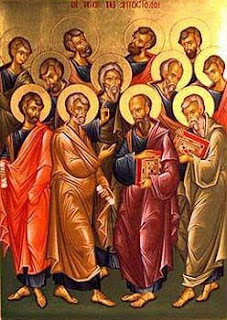 Today is the Synaxis of the Twelve Holy Apostles: Peter, Andrew, James & John the sons of Zebedee, Phillip, Bartholomew, Thomas, Matthew, James the son of Alphaeus, Jude the brother of James, Simon & Matthias. As I have mentioned before, the word Synaxis means gathering. It refers to the gathering of the saints associated with a feast, and is celebrated the day after that feast. Yesterday was the Feast of Sts. Peter and Paul — the Paramount of the Apostles. Therefore, today the Orthodox Church gathers together the Twelve. The word Apostle means The One Who is Sent. In context of Christianity, of course, one is sent to preach the Gospel; however, in context of RPGs of every genre, the PCs can be sent by a Patron to complete a specific task. These tasks, of course, can have world-affecting consequences. The Twelve, as is well known, travelled all across the known world (and beyond) founding local churches as they went. Since ancient times, local churches would trace the linage of their bishops to the Apostle who initially founded their Church. For example, Rome goes back to Peter, Constantinople goes back to Andrew and the Malayalam-speaking Christians of south west India go back to Thomas. In context of an RPG campaign, such a wide-spread and long-lasting effects require a long-running campaign world that persists enough for players to have multiple characters in multiple games/campaigns. To anyone who regularly reads my blog it will be no surprise that, like most gamers, I am very much susceptible to Gamer ADD. My imagination flies off in a myriad of directions at the slightest provocation. If, however, I allow Gamer ADD to preoccupy my actual gaming, I would never experience the joy of past character action affecting current PC play. 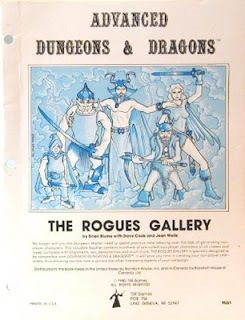 If there is one old-school product that caught my attention more than any other, it would be the original Rogues Gallery. Therein, I found all of these fascinating characters that obviously emerged from actual play. Now, I do have my own collection of favorite characters that I have played over the years. Unfortunately, they all exist in separate worlds, genres and rules. Indeed, my youth was dominated by Gamer ADD impulses and I never really got to experience the reality depicted in Rogues Gallery. That is, until now. Through forces that I don’t completely understand, a great deal of patience and focus on my part and a willingness to forgo all of the various opportunities to pursue supposedly greener pastures, my Lost Colonies campaign persists despite sporadic play, a changing cast of players and my own inadequacies as a Referee. As a result, there are now a Rogues Gallery of characters that populate a single world and that affect our current play. Even in death, the original group of PCs looms large and the menagerie of characters that they left in their wake makes my Lost Colonies campaign live in a way that I could never have accomplished on my own. The fun part is that it is this very Rogues Gallery that keeps me coming back over and over again. I look forward to the way new characters will not only interact with what has come before, but what they will leave in their wake. I only have a finite amount of time to dedicate to actual play, and continuing this campaign has a far greater pull than any new fancy toy that might briefly take hold of my imagination. In other words, continued play is something I have always aspired to and have oft wondered if the rewards were as great as I imagined. I can now attest that yes, indeed they are. This is a session that actually happened prior to my resent bouts of health issues, so you will excuse me if this is brief and lacking in a lot of detail. I had originally delayed writing about it because it was one of those highly emotional sessions that I had not yet come to terms with. After playing a key role in the Battle of Redwraith, the players decided that ridding the area of the rogue slaad and his unit of giant frog cavalry was the highest priority of all the various things they could do next. They tracked the unit back to the Black Tower and the now wide open portal. It was at this point that they got greedy and paid for it. Rather than focus on the task at hand, the party wanted to use spells like Detect Magic and Locate Object in order to find any thing of interest from the sea of dead bodies that now littered the landscape. The only problem was that the spell casters came prepared for battle, not detection. It was therefore decided to camp in order to get a different set of spells ready to scour the bodies for treasure. During the night, a basilisk found its way through the portal. Two party members, including Ahkmed, failed their saving throws and were turned to stone. The creature was eventually felled, but everyone at the table realized that of the core group of characters that had been played at the table for the last several years, only Dn. Swibish remained. It was decided that Hornet — Ahkmed’s Living Sword — would leave the group in search of a mage of great enough power to cast Stone to Flesh or otherwise find a cure for the petrified state of the two characters. In the mean time, the party buried the two six feet under, using the logic that this was the best way to preserve the two in the long term until such time that they could be cured. This meant that two players had no characters to play, the party was in pursuit of a monster and was in the middle of nowhere with no easy access to NPCs or other simple ways to get new PCs integrated into the group. It was at this point that my players came up with their own creative solution to the problem. One rolled up an elf, the other rolled up a cleric — but they requested that the latter be an elf trained by the now retired Dn. Goram. As you might recall, I struggled with the idea of allowing elves to be clerics when the party started various building projects in the Elflands. I was rather ambivalent about the idea — but my players so enthusiastically embraced the concept that I just couldn’t say no. As a result, the two new characters are elves sent by Dn. Goram to find the party in order to bring them back to the Elflands on urgent business. They came by giant eagle (something Dn. Goram has access to) and we had a fun complication as well as new characters added to the party. The session ended with several harrowing combats as the party pursued the rogue slaad into the depths underneath the Black Tower. The party found themselves slightly out of their depth, but with coordination and creative play, they managed to wriggle out of a pair of possible TPKs. The session, therefore, began with a serious loss and ended with a very real high brought on by surviving a pair of battles that the party probably had no business getting into in the first place. I hated to loose Ahkmed, but his death only made the survival of the party at the end of the session that much sweeter. It is one of the things that I love about old-school play. The death of a character — even a high level one — can actually make a session better. Now, only if our busy summer schedules can allow us to get together again to play, I can get back in the swing of things. Today marks the feast of one of the more intriguing stories that I have had the privilege of writing about on this blog — the feast of the Holy Righteous Artemius of Verkola. He was born in 1532 in the village of Dvina Verkola. As a twelve-year old child, he and his father were caught by surprise by a fast moving thunderstorm out in the fields. He fell dead as a massive thunder burst broke right over their heads. Despite being a pious, courageous and virtuous child, everyone interpreted the death as a sign of God’s judgment. Therefore, the body was left in a pine forest without burial. Several years later, a villager witnessed a light shining over where the body lay in the forest. When people went to investigate, the body of St. Artemius was incorrupt (it had not decayed). The holy relics were taken into the Church of St. Nicholas in 1577 where they were found to be a source of healing. A monastery was later built in the village which came to be known as Verkola. Ironically, the most tragic part of the Saint’s story didn’t happen in his life, but at the beginning of the 20th century. In 1918 the Communists chopped the incorrupt body of St. Artemius into bits and threw the remains down a well. Although this inspires is a great back story for a megadungeon quest (a kind of anti-Eye and Hand of Vecna kinda thing) that sees a party searching for the various remains of a saint that was thrown down the well and then skattered across various parts of the dungeon, this story puts me more in a sci-fi frame of mind. Communism did its best for two generations to wipe out the Orthodox Church. Indeed, the Synaxarion (list of saints) includes many martyrs murdered by the Bolsheviks. If systematic eradication for two generations (something that the Church has endured on multiple occasions, by the way) failed to destroy Her, the Church is going to survive whatever science can throw at Her. Indeed, since God created outer space and everything in it (including any alien species — especially any with funny foreheads), the Church will embrace what ever it is that humanity finds out there. Space will become the new desert. Monastics will build monasteries in the remote areas of space (and I secretly hope that they carve churches on the interior of asteroids) and conquer the new Wilderness for Civilization. Our modern world has replaced the faerie and the monster with the alien as its stand-in for our cultural demons (see the transformation of vampire from villain to protagonist in my life-time). Thus, a science fiction campaign is just as capable of exploring the (Christian) Civilization vs. (Demonic) Wilderness theme as is the classic D&D campaign. Things get only more interesting when the alien (demon) is us. There have been several health issues that have assaulted myself and my family over the past week or so. Nothing terribly serious, but seriously uncomfortable. Blogging, therefore, has been way down on the priority list and probably will be for at least a little bit...I'll get to having fun as soon as I can. Though I could (and would love to) go over all the particulars involved in this story, it would take several posts due to the complexity of both the events and the theology involved. In short, this period is rife with a rivalry between Antioch and Alexandria. The theological approach of Antioch emphasized Christ’s humanity and is best represented by St. John Chrysostom. When pushed too far, this approach produced Nestorianism. Alexandria, on the other hand, emphasized Christ’s divinity. Sts. Athanasius and Cyril best represent this approach. When overemphasized, this approach produced the heresy of Monophysitism. Ultimately, both approaches are necessary in order to balance out the excesses of the other. However, I myself prefer to start with the Alexandrian approach and arrive at the Antiochian approach. Indeed, I have a great fondness for the saints of North Africa. 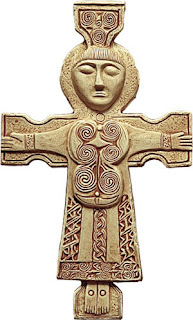 One might be tempted to call this a Celtic Cross; however, this assumption would be incorrect. Rather, it is Ethiopian in origin. In the Roman Empire, there was a trade route that went from Alexandria to the southern coast of Britain, which was a Roman colony beginning in A.D. 41. 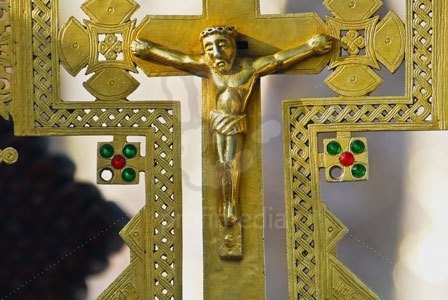 It is very likely that the Christianity that flowered there (bishops from Britain were at the First Ecumenical Council) had its origin, in part, in North Africa. I mention this to point out the cultural pastiche that is Christianity. It engages in the culture it finds itself and integrates those things that speak to the Christian faith while holding onto everything that it already had. Despite the vast differences in language and culture that existed throughout the ancient world, Christianity successfully spoke to all of them while maintaining both local and universal customs. When D&D is at its best, it is also a pastiche. It freely borrows from S&S, science fiction, history and religion. This is one of the reasons why I believe it is the giant gorilla of the RPG world. Whereas other RPGs are much more specific (and therefore niche), D&D is generic in both its concept and its mechanics. One can just as easily play D&D in a fantasy version of Mesoamerica as one can in a distant dark fantasy future. It can shoulder both the gonzo and the serious. If one considers all of the various editions as a body of work, it can also handle the old school, the new school, fast and loose play as well as play approaching a tactical miniatures war game. Regardless of the success or failure of 5e, we will all pay some amount of attention because it is the gorilla of the RPG world. It became that gorilla because at the very beginning, it embraced the pastiche rather than the niche. Here is to hoping that WotC understands this as well as the legacy they have in every edition of the game. 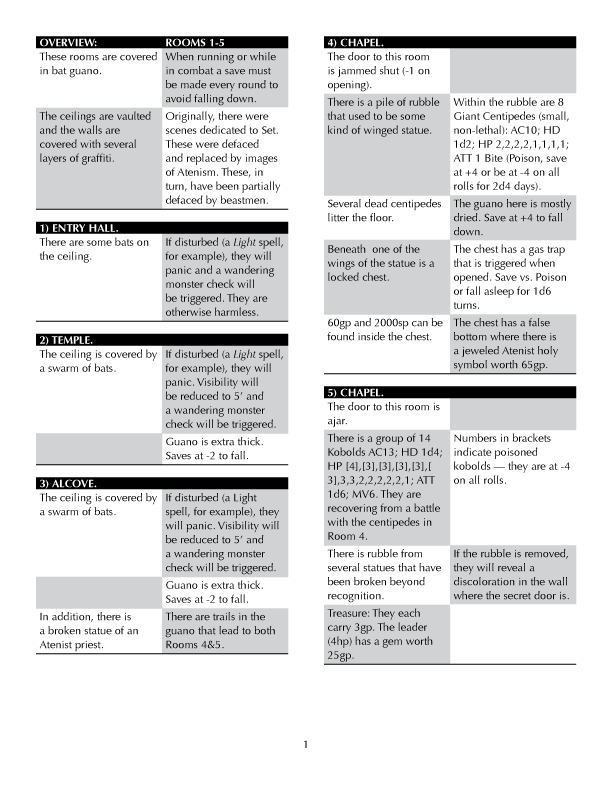 Last week, I posted an attempt at a dungeon module layout, organizing ideas by bolding and italicizing various sections of each room description. This generated two outstanding replies. One of the many hats that I have worn over the course of my life is that of a typesetter. In other words, I spent several years turning someone else's text and a publisher's specifications into a working template that I and other typesetters could then use to produce the electronic side of a textbook. As a result, when confronted with the excellent ideas of -C and Jim, my inner typesetter instantly started trying to figure out a template that I could use to produce modules. I love the way -C's approach flows. I love the visual organization of Jim's approach. However, neither entirely scratches my visual itch. Thus, instead of blogging this week, I have been busy fiddling with a template. I have attempted to organize it using both -C's and Jim's techniques. The left column of each entry indicates stuff that can be given to players with the most immediate/important details at the top and the less immediate/important details at the bottom. 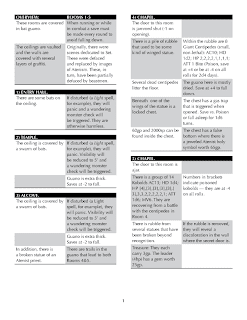 The right column of each entry indicates crunch for the Referee about what is immediately to the left and/or information that can be given to players if they do more of an investigation of the information immediately to the left (or above). One thing that I envision with this is a map of just these rooms on the same spread. Therefore, everything you need for these rooms is right in front of you. The map would indicate which page you needed to go to if the players move off that section of the map. For those who wanted it, there would also be a version of the entire map with each spread stitched together. Today is the feast of St. Nicephorus the Confessor. Born about A.D. 758, his father Theodore was embroiled in the first wave of iconoclasm that hit the Byzantine Empire. Under the iconoclast emperor Constantine V Copronymus, Theodore was imperial secretary. When it was revealed that he was an iconodule, the emperor tortured and then banished him. Nicephorus followed in his father’s footsteps and became imperial secretary when the iconodule Irene and her son Constantine VI came to the throne. With the help of the Patriarch St. Tarasius, the Seventh Ecumenical Council was convened to defend the use of icons. Nicephorus was secretary. He later decided to take on the monastic tonsure. He also founded several monasteries. After the death of Tarasius, he was elected Patriarch of Constantinople in A.D. 806. When Leo the Armenian came to power, he set off the second wave of iconoclasm. St. Nicephorus was attacked, deposed and exiled. 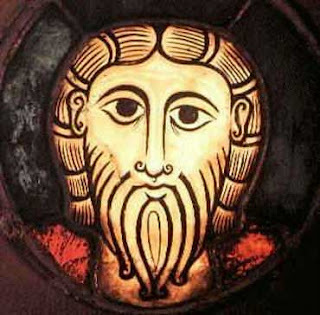 He died in one of the monasteries he founded in A.D. 828. As I have noted before, the title Confessor is given to those saints who are tortured, imprisoned and/or exiled for the faith but not martyred. One might be surprised that people would be willing to go to such lengths to defend icons. For Orthodox Christians, it is a matter of Christology and the ability to defend the incarnation of Christ. To illustrate this, I am going to touch upon something that might appear to be politically incorrect, but it does a very good job of making my point. Recently, there has been some scholarship into the historicity of the Prophet Muhammad. Evidently there are enough uncertainties in this history that it is possible for Robert Spencer to ask the incendiary question Did Muhammad Exist? Islam is militantly iconoclastic — it is unlawful to depict Muhammad in any way. Indeed, Muslims tend to react violently when their prophet is. In the face of historic criticism, however, this iconoclastic stance becomes a liability. If the critical study of the origins of Islam raise serious doubts over the historic reality of the prophet, than this militant iconoclasm only reinforces those doubts. Indeed, one is forced to ask: Is the reason Muhammad can’t be depicted because he was never a real person? These same questions could be leveled at Christianity if we didn’t insist that there must be icons. We insist on those icons because we insist that Christ entered into history as a real human being. For those of you who have read this blog for a while, there are some things from the later editions of D&D that I do like. One of them happens to be the idea of the Prestige Class and I have fiddled with the idea in order to make them old school. The Confessor is an example of a prestige class that arises out of game play. In order to qualify as a Confessor, one must have been tortured, imprisoned, exiled or otherwise violently persecuted because of one's faith. Upon reaching 4th level (or higher), the player of any class may elect to become a Confessor. Disadvantage: Due to the hardship of defending one's faith, the character has developed a serious physical handicap. This can be decided with the Referee according to the history of the character. Examples: Loss of the use of a hand/arm (no shields or T-H weapons); loss of an eye (no missile weapons); loss of voice (no spell casting with verbal components); bum leg (half movement rate). Advantage: The Confessor has developed a tremendous amount of willpower in order to ignore pain. In addition to the normal abilities that the Confessor gains in their base class, they get a DR of 2 verses one type of damage. As the Confessor gains more levels, an additional DR of 2 is added which may be cumulative towards a type already chosen or it may be applied to a different type of damage. As I have mentioned in the past, stocking a dungeon is my least favorite part of the whole process of making an adventure. Normally, I will make a few notes and a wandering monster table and I am good to go; however, I am in process of trying to write up my re-imagined version of the Slave Pits of the Undercity. Therefore, I have to do more than my sparse notes in order to make the adventure useful for someone else to use. Admittedly, I have struggled with this and have been experimenting with a couple of different formats. Part of the rash of Gamer ADD that has afflicted me of late is due to my unhappiness with my write-ups about the Slave Pits. OVERVIEW: ROOMS 1-5 are covered in bat guano. When running or while in combat a save must be made every round to avoid falling down. The ceilings are vaulted and the walls are covered with several layers of graffiti. Originally, there were scenes dedicated to Set. These were defaced and replaced by images of Atenism. These, in turn, have been partially defaced by beastmen. 1) ENTRY HALL. There are some bats on the ceiling. If disturbed (a Light spell, for example), they will panic and a wandering monster check will be triggered. They are otherwise harmless. 2) TEMPLE. The ceiling is covered by a swarm of bats. If disturbed (a Light spell, for example), they will panic. Visibility will be reduced to 5’ and a wandering monster check will be triggered. Guano is extra thick. Saves are at -2 to fall. 3) ALCOVE. Same as Room 2. In addition, there is a broken statue of an Atenist priest. There trails in the guano that lead to both Rooms 4&5. 4) CHAPEL. The door to this room is jammed shut (-1 on opening). Within the rubble of a winged statue are 8 Giant Centipedes (small, non-lethal): AC9; HD 1d2; HP 2,2,2,2,1,1,1,1; ATT 1 Bite (Poison, save at +4 or be at -4 on all rolls for 2d4 days). The guano here is mostly dried. Saves are at +4 to fall down. Several dead centipedes litter the floor. Treasure: 60gp, 2000sp, and a gold & silver Atenist holy symbol worth 65gp. 5) CHAPEL. The door to this room is ajar. There is a group of 14 Kobolds AC6; HD 1d4; HP ,,,,,,3,3,2,2,2,2,2,1; ATT 1d6. They are recovering from a battle with the centipedes in Room 4. Numbers in brackets indicate poisoned kobolds — they are at -4 on all rolls. There is rubble from several statues that have been broken beyond recognition. If the rubble is removed, they will reveal a discoloration in the wall where the secret door is. Treasure: Each kobold carries 3gp. The leader (4hp) has a gem worth 25gp.